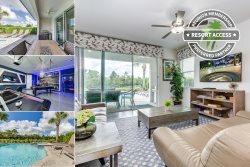 Solara Resort Vacation Home Rentals close to Disney World, Orlando Florida. The ultimate vacation resort. Solara Resort is only 8 miles to Disney and within a short drive to Universal, SeaWorld, and I-Drive. This gated resort community is in the center of it all! An extensive amenity complex is at the heart of the Solara Resort and it includes luxuries to satisfy every member of your family, including a splash park, FlowRider® surf simulator, teen hangout, and bar. Solara Resort’s Grand Clubhouse features an expansive water complex, bar and grill, ice cream parlor, sundries store, fitness center, outdoor fitness lawn, indoor and outdoor lounges, workstations, tween/teen hangout center and much more. Recreation Have some fun in the sun and challenge the family to a game on the basketball court, beach volleyball court or full-size soccer field! Cool down in style and enjoy one of Solara Resort’s water amenities such as the expansive, zero-entry pool, separate children’s splash pad, water slides and more! Solara Resort is located in the heart of the Orlando entertainment area. Unrivaled by far, the City has been dubbed the US entertainment capital. Coupled with beautiful weather and near-by beaches, there is no wonder Orlando is the #1 vacation destination in the nation. Are you interested in Property Management? If you're interested in our comprehensive property management and marketing services please get in touch. We're actively taking on Solara Resort Rental Homes. If you're not already an owner but would like to be, please contact us and we can refer you to a local Realtor that specializes in the area to get you on the path to being an owner.